A particularly great offer is the complimentary 24-hour room service and the free breakfast service. Every night you will get a new door hanger with a selection of breakfast items to select. You can place your order outside the door until 1 am. 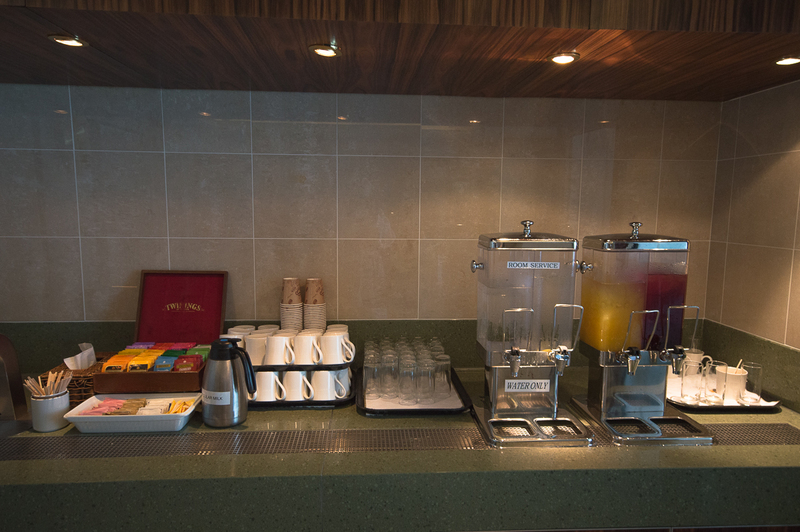 There are different juices (for example apple, orange, grapefruit, cranberry), coffee, hot chocolate, tea and various kinds of cereals (e.g. Bircher Muesli, Special K, Frosties, Weetabix), eggs (e.g. scrambled eggs with or without salmon, fried eggs), hash brown potatoes, English bacon, baked beans, fruits, toast, jams, honey, croissants and muffins. There is something for everybody. 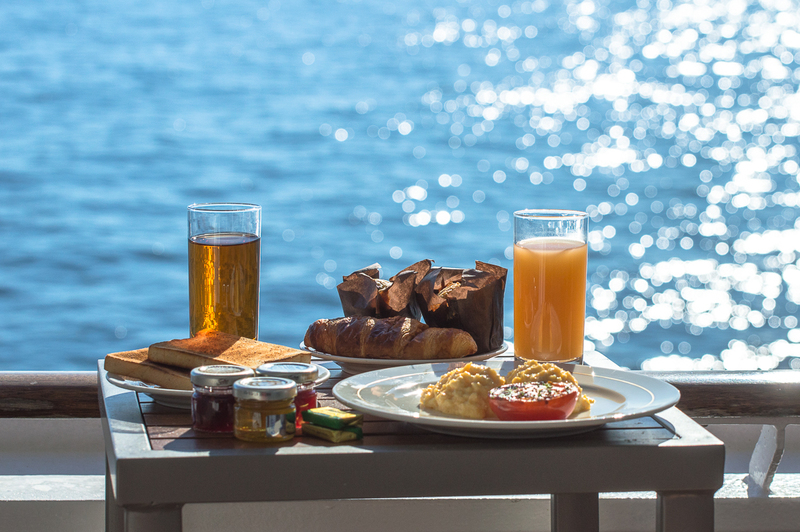 We loved the decent breakfast in the cabin, especially on days at sea! On each cruise, there are interesting guest speakers on board. 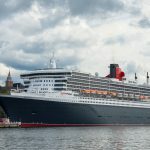 On our Norway cruise we saw the show of the German comedian Beikircher, we listened to a lecture of Bernd Stolzenberger (former CEO of Hurtigruten) and Dickie Arbiter LVO (The Queen’s Press Spokesman). 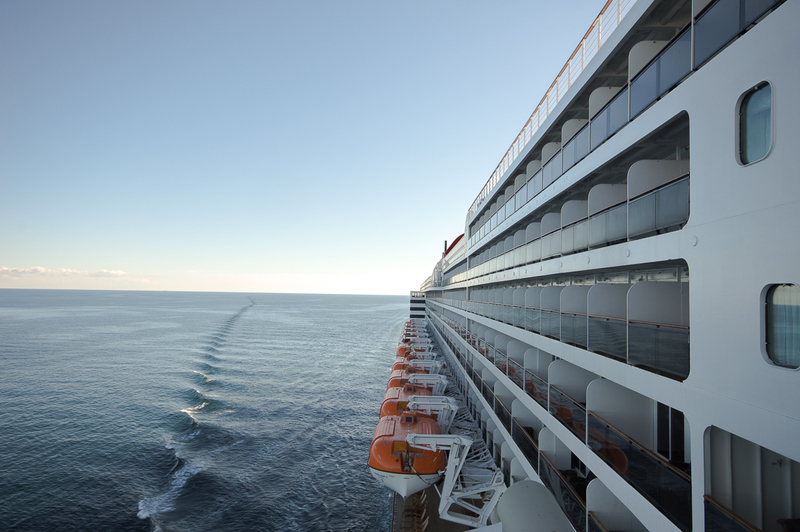 Some of the lectures were even recorded and broadcasted on the onboard TV. The lectures took place either in the Illuminations or the Royal Court Theatre. At the ship’s bow there is a great place, directly under the bridge. 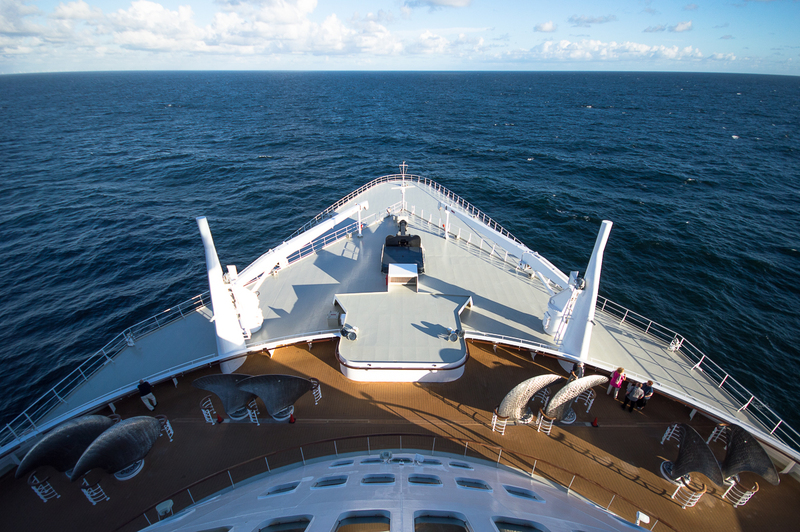 The Observation Deck on Deck 11 offers a unique view of the ship’s bow, the extra propellers and the sea. 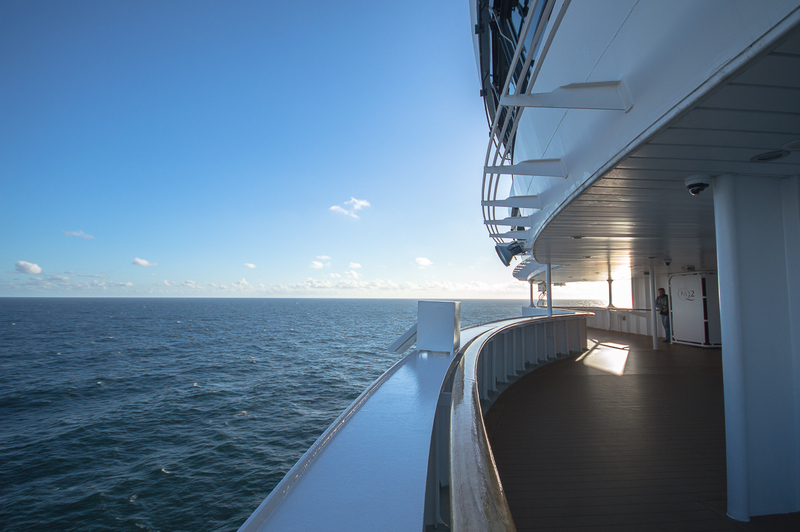 On sea days, it is possible to take a look at the bridge. 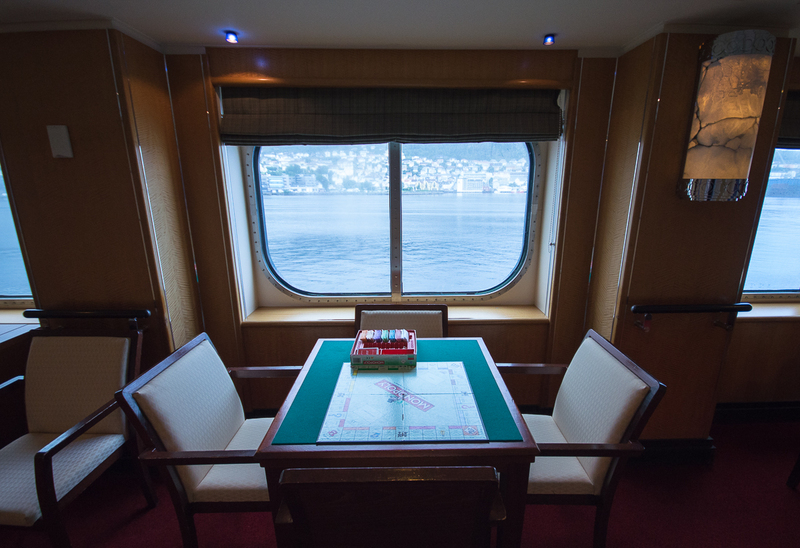 There is a door with glass panels with a direct view of the navigational charts of the captain. Unfortunately, it is not allowed to go on the bridge itself (only during a behind the scenes ship tour) and you can’t take any pictures. But you can at least take a glimpse at behind the scenes for free at this door. 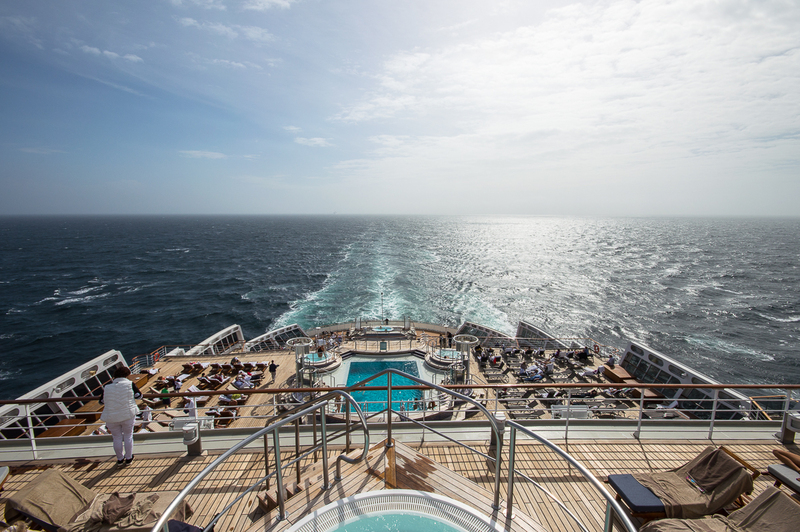 Where would it be better to relax than on a cushioned sun lounger overlooking the sea? 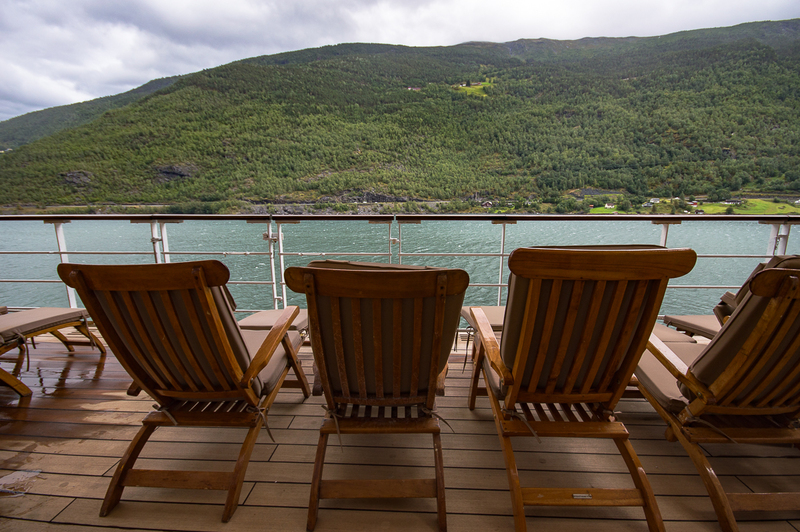 We love the lounge chairs on deck 7, because they are so comfortable. A picture is indeed worth a thousand words. A special highlight is the British pub lunch at the Golden Lion Pub. Lunch is served from 12 to 2:30 pm. They offer a variety of food from a typical English pub. 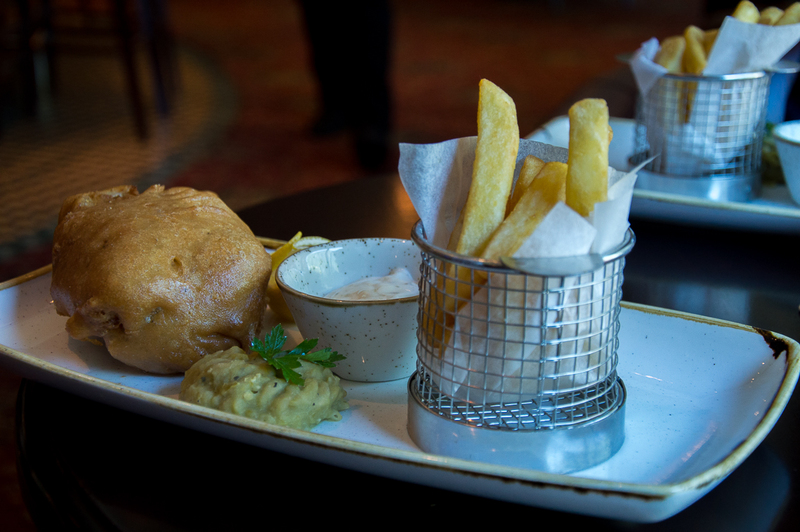 We especially recommend the dish Fish & Chips. You can order it even if it is not on the menu. So do not be shy and just order! Of course, all dishes are free of charge. 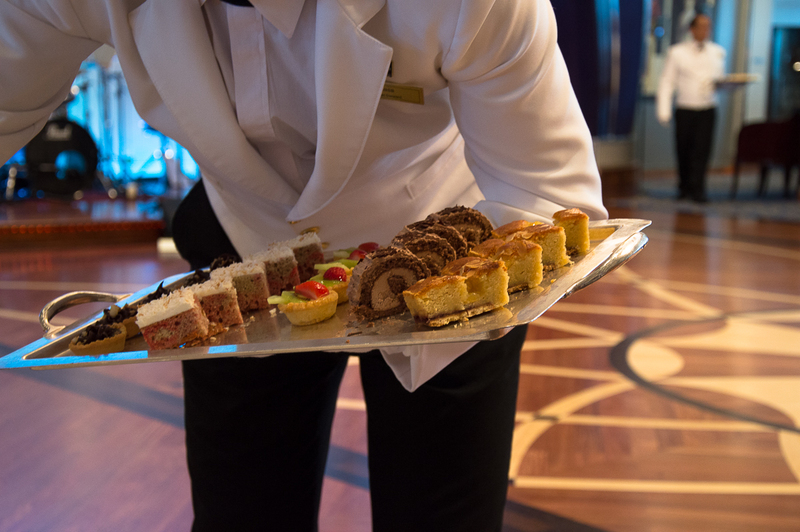 The new Godiva Café in Sir Samuel’s on deck 3 invites everyone to arrive in chocolate heaven. 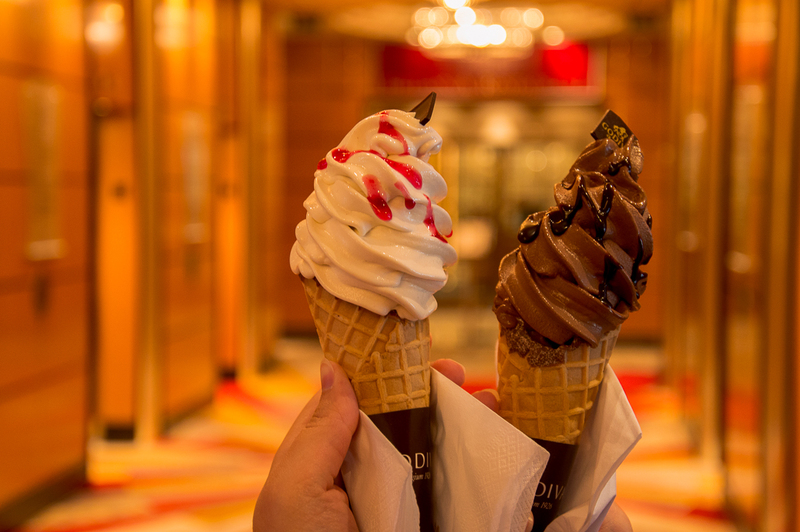 You can try delicious chocolates, cakes, hot chocolate and ice-cream. You can eat and drink in this café for an extra charge. An ice cream costs 4.50 US dollars and 6 chocolates in a gift box costs 10 dollars. 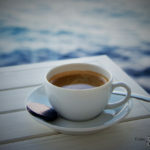 There are also offers to order a drink in the cafe and try some chocolates. It is definitely a nice experience on board. 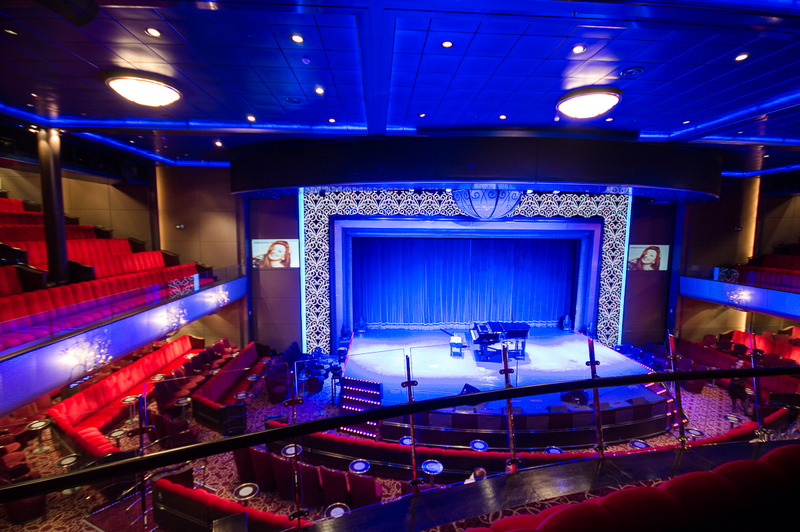 In the planetarium on board at Illuminations there are shows on each day at sea. On our trip there were even shows in English and in German, but there is always a translation device with headphones for other languages. There are 150 adjustable armchairs that invite you to explore the history of space. You can get the tickets for the shows on deck 2 from 9 am at the ConneXions counter. The tickets can be found in an open plastic stand. 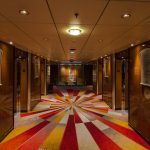 On deck 3L, next to the Royal Court Theatre, there are corridors used as a game area.. 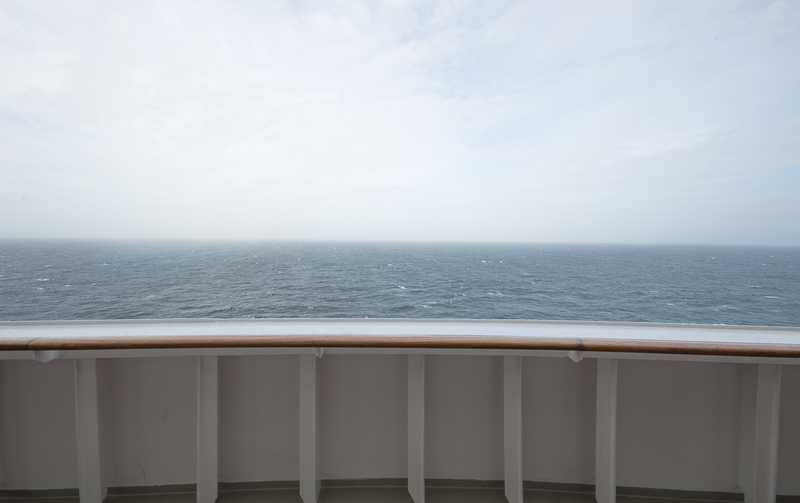 There are some tables and chairs at the windows overlooking the sea. But these are not just tables to sit and rest, but to play. On each table are different games, such as Monopoly, Scrabble, Trivial Pursuit or Clue (Cluedo in Germany). In the middle of the table row there is even a wider table for large puzzles. 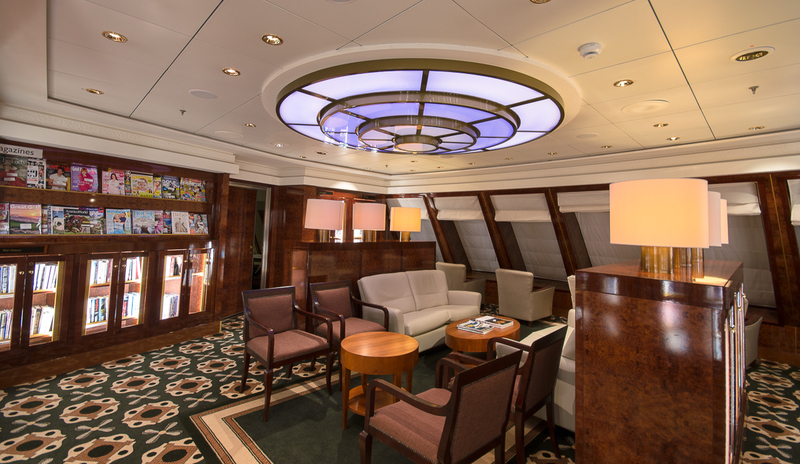 The Queen Mary 2 has a huge variety of books on board. 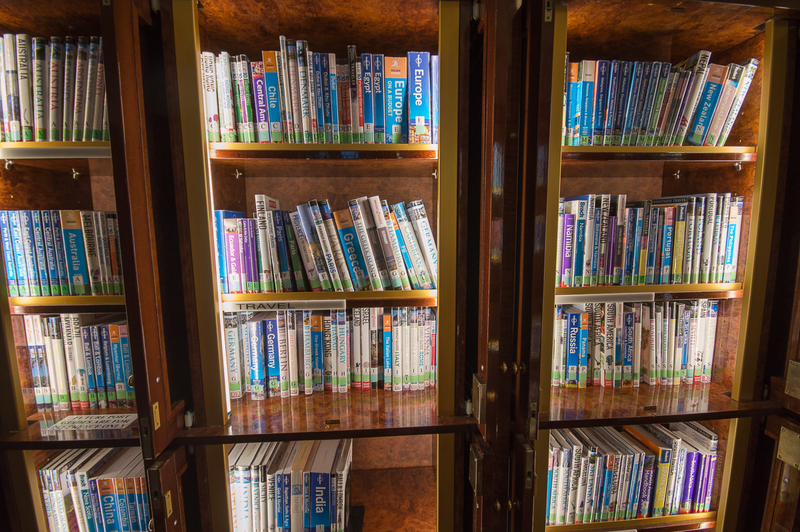 It is the only cruise ship with a library of about 10,000 books in various languages. The majority (8,000) of the books are in English. 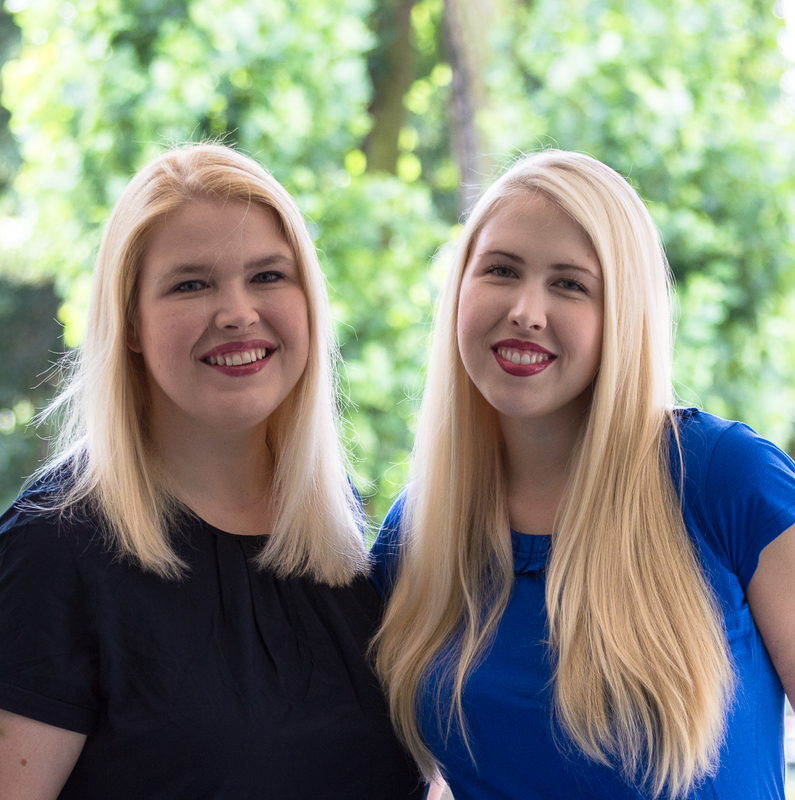 But there are even more than 800 books in German as well as books in Japanese, Spanish, Italian and French. 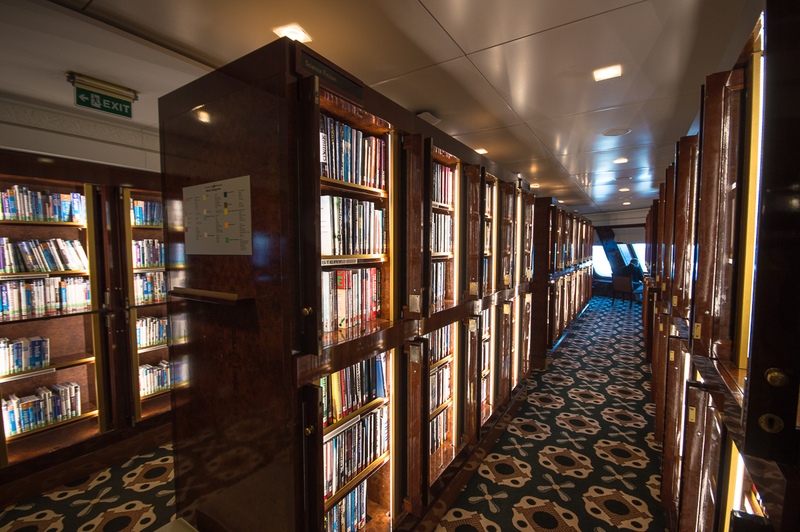 The library is located on deck 8 at the ship’s bow. There are travel guides, non-fiction books, fiction books and periodicals. You can either sit alone in a chair in the library overlooking the sea while reading a book or you can borrow the book. In addition, the library is attached directly to a bookstore, where you can even buy the latest best selling books. Here you can also buy coloring books with pencils for children. Furthermore, there are greeting cards, if you forgot the birthday on board, and you can buy souvenirs. 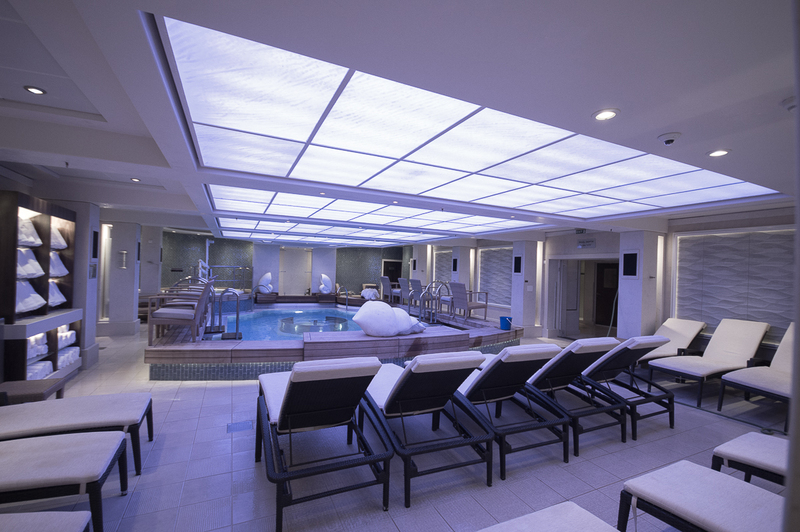 The spa area includes nearly 2,000 square meters. For 40 dollars you can buy a day pass and relax in the hydrotherapy pool with jacuzzis and water jets. 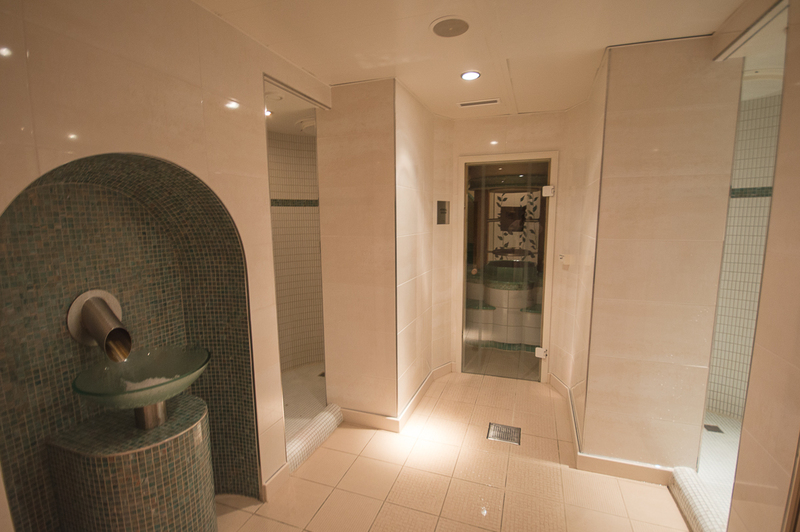 There is also an aroma steam bath, a herbal sauna and a Finnish sauna. 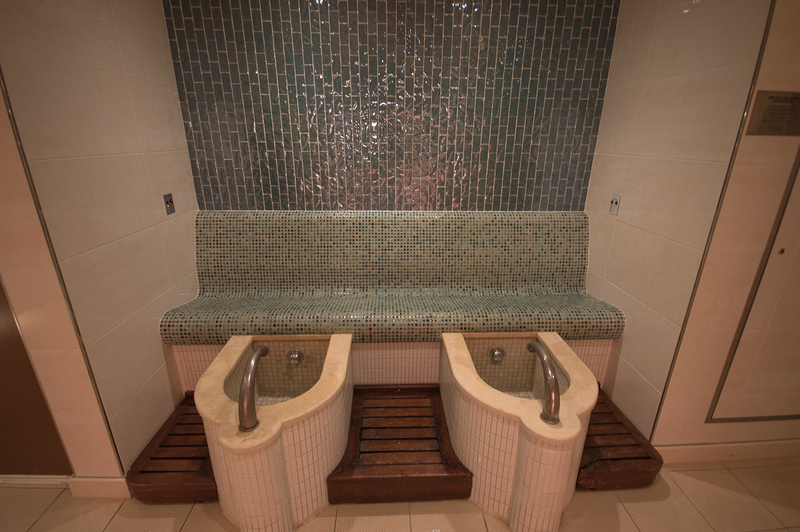 Additionally you can try a foot bath with hot or cold water and massage jets. You can visit the spa in a bathrobe. It is advisable to bring slippers. In addition, you always have to wear a swimsuit or trunks. 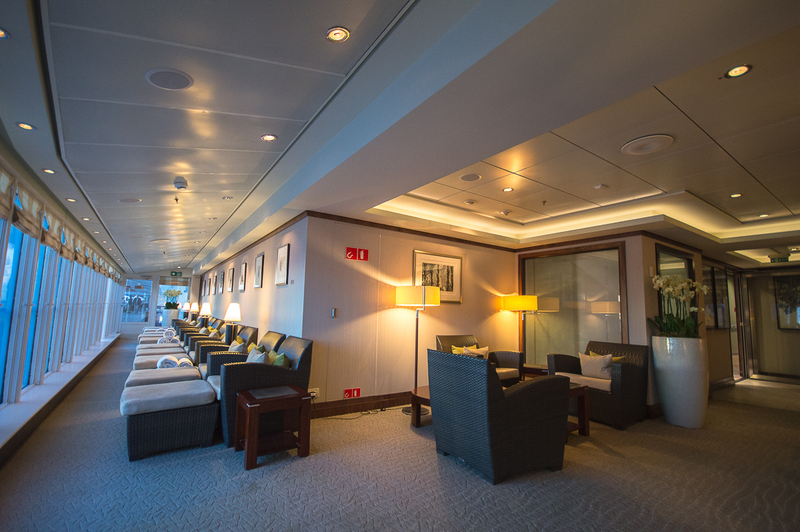 To relax after swimming or a body treatment, there is a relaxation area with a drinks corner (tea, water and juice) and loungers overlooking the sea. There are also numerous magazines for reading and towels which you can use as a blanket. There are also offers for longer enjoyment. 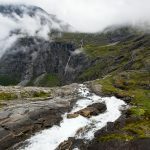 For example, you can buy the 6-day pass for 105 dollars. Don’t be shocked by the high prices of body treatments in the spa (for example 80 minutes Canyon Stone Massage for 446 dollars), because in the daily program you can always find a good deal. For example, a 80-minute deal with hot stone massage, head massage and foot massage for 159 dollars. Beneath the offer, there is usually a code word that you can use for reservation to save 20 dollars. 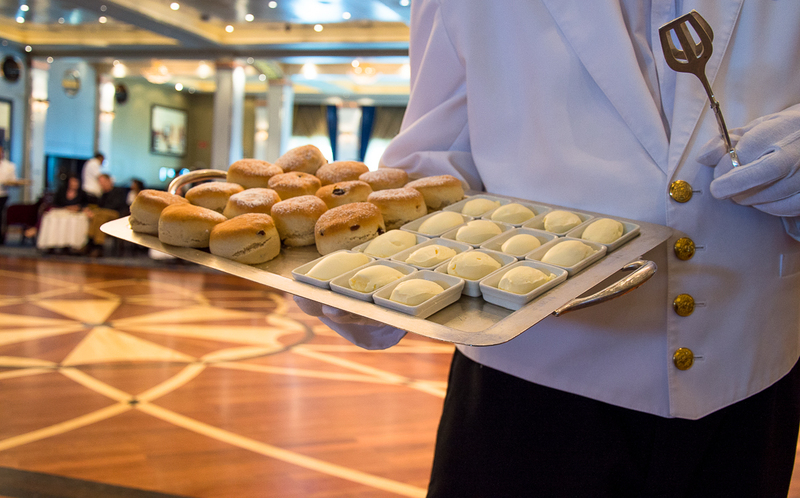 At 3:30 pm it’s time for afternoon tea in the Queens Room on Deck 3. You should get here already 10 to 15 minutes earlier, because there is always a long queue at the entrance. They open the doors to the Queens Room on time. Before entereing the room you get hand sanitizer from a crewmember and then you can walk inside and choose a nice table. The tables are already set and the small jam jars and milk are available. We loved the places in the first row directly at the dance floor. 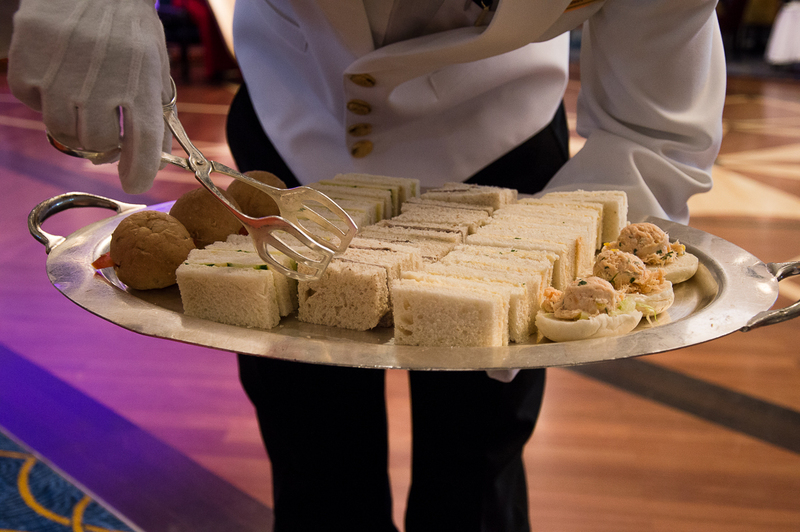 Do not worry, there is no dancing during the afternoon tea. But there is always a great musical accompaniment, which you can see and hear very well from here. 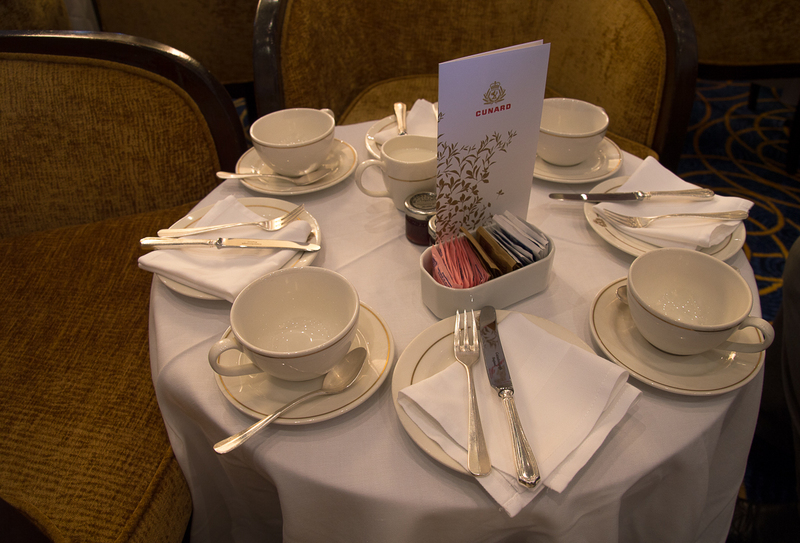 The waiters all enter the room in a row with trays or teapots in their hands. 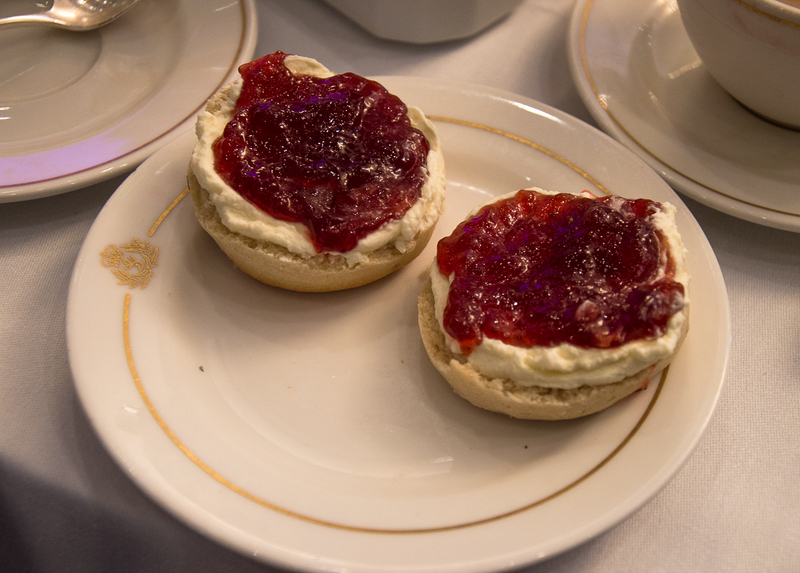 They offer you sandwiches, cupcakes and scones with clotted cream. 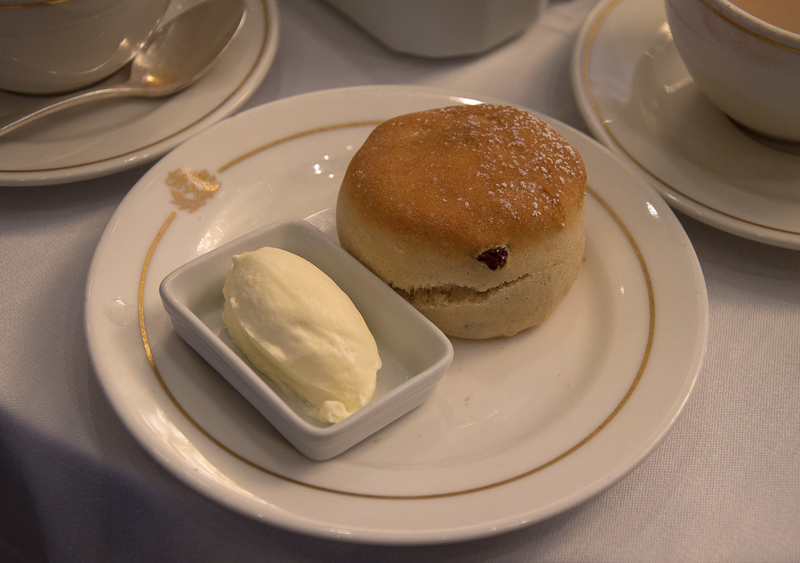 The scones with raisins are simply fantastic. Of course you should drink a cup of the English Breakfast tea. 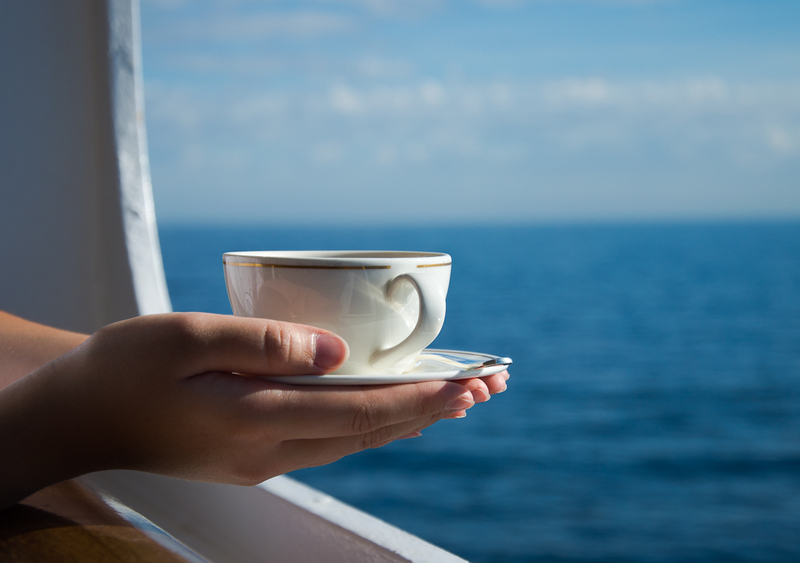 If you wish, you can get decaffeinated tea, Darjeeling or Earl Grey instead. It is a wonderful afternoon experience and it is always fun. Looking for a movie? No problem. 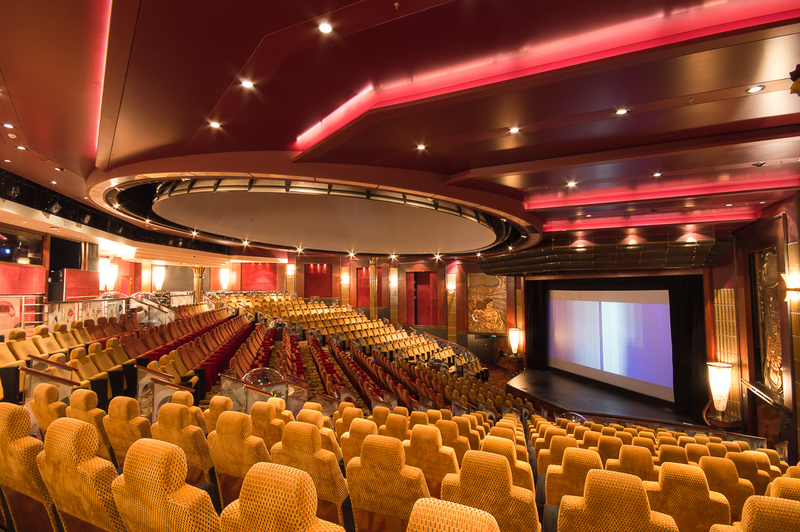 In Illuminations on Deck 3 you can watch a movie with a cinema atmosphere. 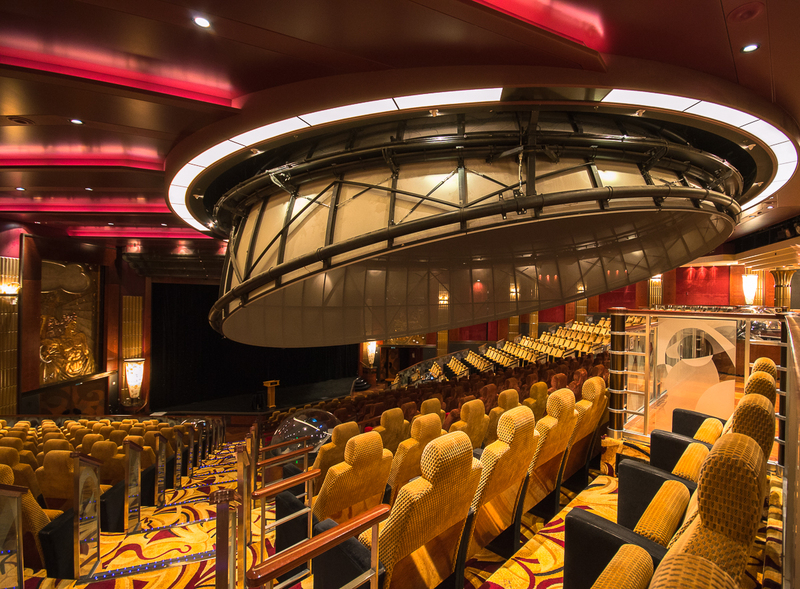 There are more than 470 seats for movie lovers. 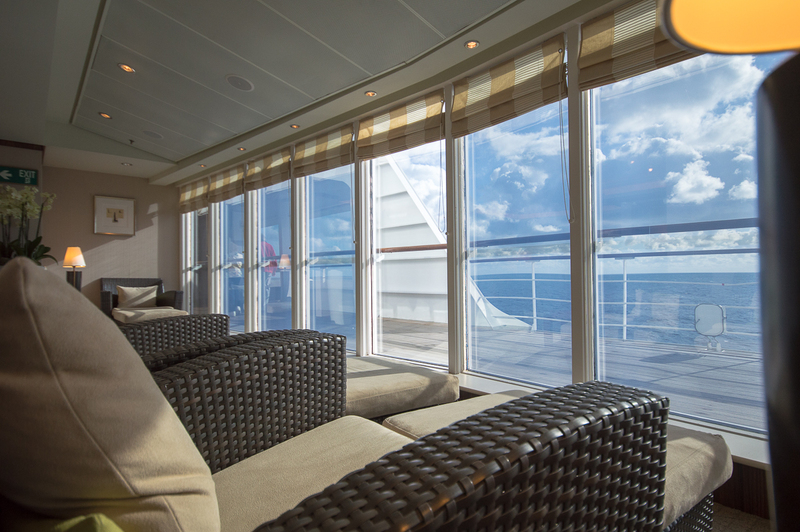 On our cruise you could watch movies in German and English. 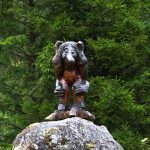 They offered movies like “Hail Caesar!”, the new movie “The Jungle Book” or “Zootopia”. But there were also films in 3D, such as “Star Wars: Episode VII: The Force Awakens.” Movies run at different times, so it is worth taking a look in the daily program. 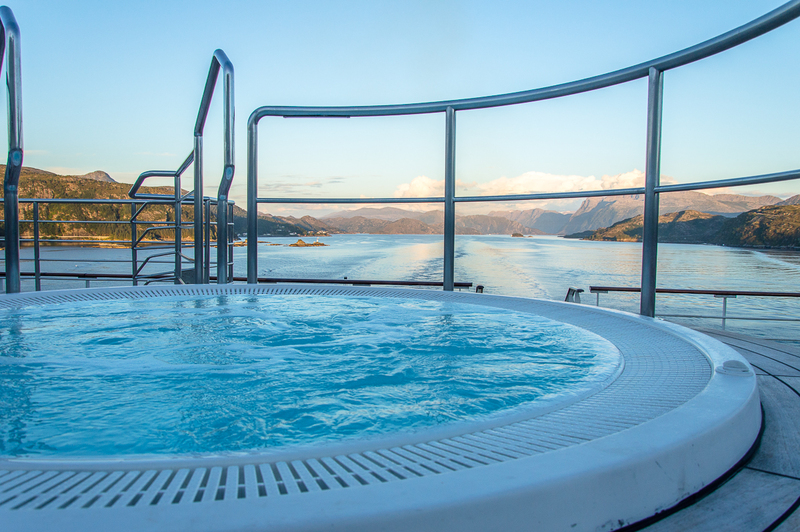 On deck 8 there are two nice jacuzzis with views over the stern of the ship and the sea. 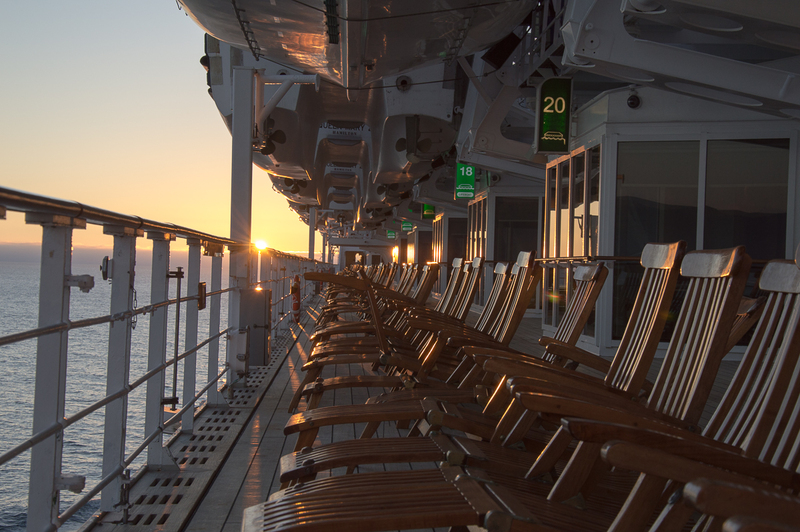 Here you can really relax and enjoy the sun. 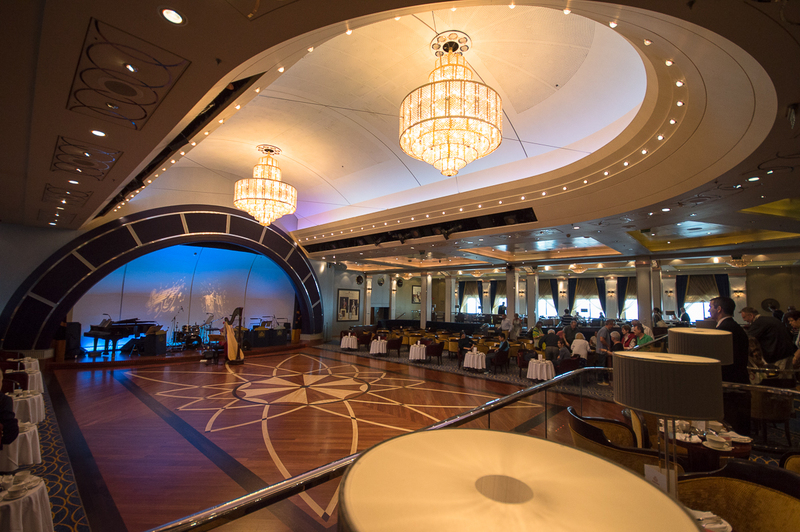 The Carinthia Lounge on deck 7 is brand new. It offers comfortable armchairs, sofas, chairs and barstools. 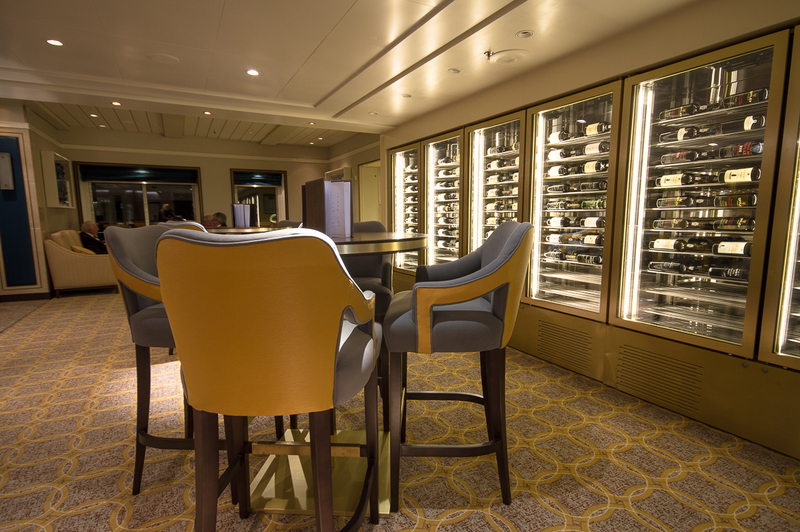 This lounge has a unique collection of port wines, which invites you to enjoy the quiet and sophisticated atmosphere with a glass of wine. 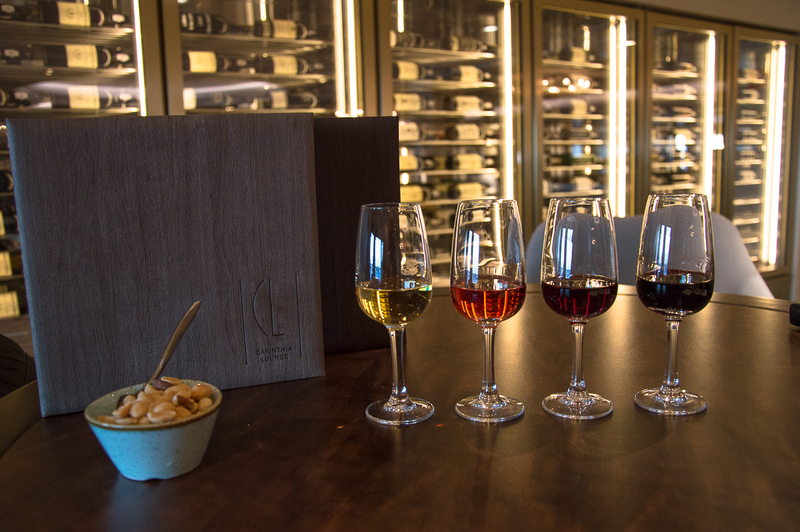 We recommend you to try the Port Tasting Flight: A range of four port wines for 10.95 dollars. We tried 30 ml of The Port Sampler White, Rosé, Ruby & Tawny. The Port wines were Taylor’s Chip Dry, Offley Rosé, Graham’s LBV and Ferreira Dona Antònia Reserve. A single glass of Port wine costs 6.95 dollars. The Port Tasting Flight was really fun and we loved trying different tastes. 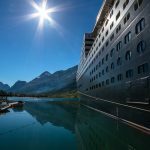 Next PostWhat to Do on a Sea Day Aboard the Eurodam?